Just by saying the fridge was in the bathroom is enough. The property was close to the airport, which was a plus. I put one filter when searching for property and that was free airport shuttle. There was a $10 amenity charge so it was anything but free. I liked that you it was close to the airport. Older hotel in desperate need of remodeling. Limited parking spots. A renovation is really needed! Also could not sleep, bed was terrible. Did not feel safe in my unit, door felt insecure, window blinds was did not provide privacy. Do not stay here! Very cheap hotel. The money that you pay is not worth it. Nice people, hotel in middle of nowhere. Room was a little dusty and floor was dirty. Good value, would stay there again (on budget). Super close to airport too. Nice location in that regard: driving into Waikiki or other places on island. Not many options in walking distance as far as food, etc. Nice little bar next door. Nice hotel but the lighting in the room was dingy. Nice Hotel close to the airport, pool and shuttle bus service included. I stayed here because my usual hotel was booked and I needed to be on the west side for business. This is an old hotel with small rooms and 1960s amenities. It is close to the airport and if you have an early morning flight you can risk a night here. 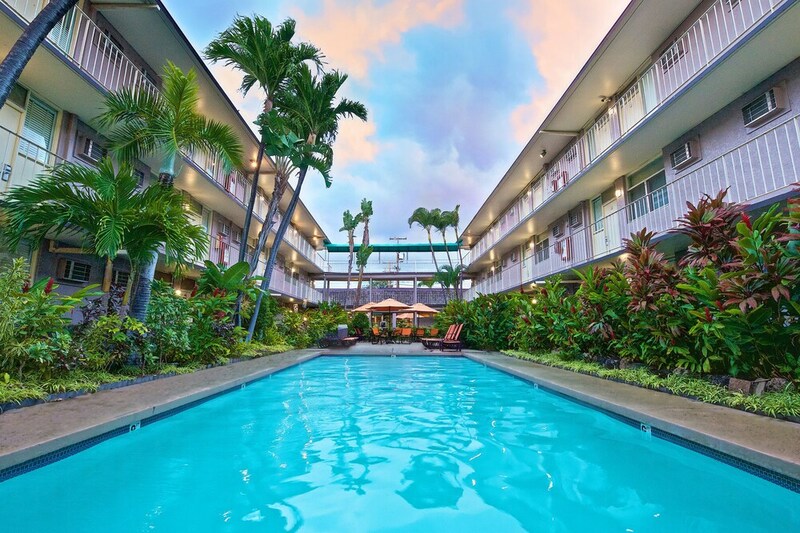 Located in Western Honolulu within a short walk of Keehi Lagoon Park, Pacific Marina Inn Airport Hotel is within 2 miles (3 km) of Moanalua Gardens. This 119-room hotel has a bar/lounge along with conveniences like an outdoor pool and free in-room WiFi. At the end of the day, the bar/lounge is a great place to grab a drink. A flat-screen TV comes with cable channels, and guests can stay connected with free WiFi. Other standard amenities include a refrigerator, a ceiling fan, and a phone. At Pacific Marina Inn Airport Hotel, guests have access to an outdoor pool, an outdoor tennis court, and free WiFi in public areas. There's free parking, as well as a free airport shuttle (available 24 hours). The 24-hour front desk has staff standing by to help with luggage storage, and answer any questions about the accommodations. Additional amenities include coffee/tea in a common area, free newspapers, and laundry facilities. Canoe Hut Lounge - Lobby lounge. Open daily. Recreation features at Pacific Marina Inn Airport Hotel include an outdoor tennis court and an outdoor pool.